Claire and I harvesting Golden Delicious apples in the Fall. Perhaps one of the greatest gifts Delphi can provide its interns with is intensive work with trees throughout the estate. The fruit and nut orchard boasts several dozen unique and rare varieties of stone and pome fruits, citrus, and olives as our Mediterranean climate allows both deciduous and evergreen trees to thrive alongside the other. Hosui asian pears, Elephant Heart plums, Medlars, Quince, Saijo persimmons, pistachios, chestnuts, almonds, an array of cherries, and over a dozen different apple and European pear varieties, to name a few. Some trees are mature and highly productive while others have been recently planted and are in need of initial training and a different level of care. Between fruit thinning, irrigation, summer pruning, orchard floor management, branch propping, harvest, nutritive and preventative dormant season spray schedules, and winter pruning we definitely give our cultivated fruiting trees a lot of attention. The return for this, however, is always enjoyed and appreciated: fruits are shared and eaten fresh or are solar dehydrated, made into jams, wine or liquors, or processed in a number of other ways. Shiro plums are consistently abundant. Because they remain small despite extensive thinning, and because we always have more than we know what to do with, we've experimented with making a country wine with them last year. Although still bottled and hopefully aging well, I can report that we enjoyed at least moderate success with this first attempt! The gifts of the native, exotic and specimen trees throughout the estate are also not to be ignored. We work with many of these intimately and simply admire others for their natural form, or highly pruned and trained forms, and how they work together in a designed setting. The Kashmir cypress, for example, towers majestically at a place where two paths meet and provides some shade for the stable that is just to the south and west of it. A few of its branches inevitably make their way in our annual holiday wreaths. In late Spring we gather the flowers from silver leaf linden trees that mark the edge of a path and a whole area. There is a single week where, to walk by them, one becomes instantly intoxicated by a fragrance that is floral, bright, clean, and alluring all at once. A single flowering branch in a vase can lift the energy of an entire room. We distill these flowers, at the height of bloom, into a lovely hydrosol to use throughout the year: either in the washing machine or as a refreshing linen spray. We will collect and roast ginkgo nuts (recipe courtesy of Ellen Zachos) in late Fall from the small collection of female ginkgo bilobas -- trees so ancient they were here when the dinosaurs roamed the Earth. The native trees and shrubs that thrive at Delphi - Madrone, Manzanita, and Ceanothus, to name just a few - are wonderful attractants for the pollinators and birds, and we have experimented with some of their edible, or other, properties, as well. Peter Quintanilla is a talented and knowledgeable local arborist who has taught several workshops at Delphi on pruning fruit trees. He teaches the Arboriculture and Landscape Pruning classes at Cabrillo College as well as workshops for home gardeners, UCCE Master Gardeners, Green Gardeners, landscape crews in Monterey and Santa Cruz Counties. We are grateful for his mentorship, and friendship! 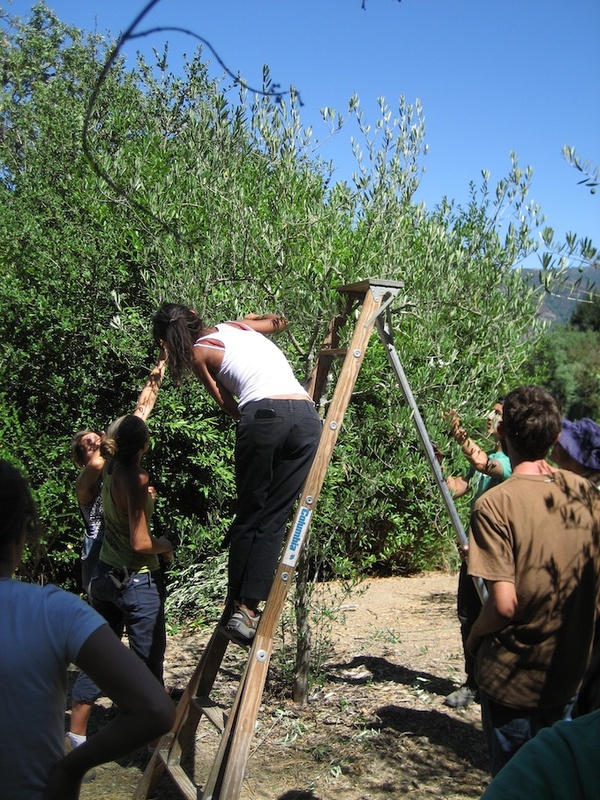 Photos from a pruning and training workshop for the Santa Cruz CRAFT Network. Trees are some of life's oldest living things with many lessons to share with us. Perhaps the greatest is to observe, and mimic, their impressive break forth into Spring with buds, colors, leaves, and finally fruit. To know innately when it is time to shut down and be unimpressive, when it is time to rejuvenate, is the essential second part of their life cycle. It is one we must follow, as well.